Grevillea ‘Forest Rambler’ is said to be a hybrid between Grevillea shiressii and one of the umpteen forms of Grevillea juniperina. Grevillea ‘Forest Rambler’ is a spreading shrub with bright green, prickly leaves and unusual translucent pale purple-pink flowers. Spring is the main flowering period although some flowers may appear at other times. The flowers are rich in nectar. The flower colour is reminiscent of Grevillea shiressii. This gives weight to the theory that this species is one of the parents. 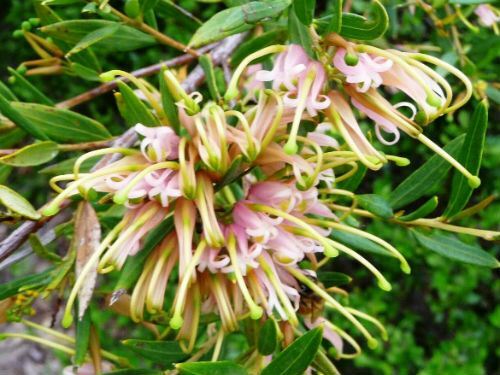 Grevillea ‘Forest Rambler’ is described as a sprawling shrub 50 cm high by two metres wide. In our cold climate garden this description is a trifle conservative. We have a ten-year-old specimen that is nearly two metres tall and three metres wide. This specimen is in a neglected part of the garden and has never been pruned. Other, better-maintained specimens are one metre tall and two metres wide. Grevillea ‘Forest Rambler’ is worthy of a place in the larger garden. Our plants have proved to be hardy, drought resistant, frost tolerant, free flowering and bird attracting. What more could be asked of a plant?